Dim Coumou and Stefan Rahmstorf of the Potsdam Institute for Climate Impact Research say that the jury is still out on how – or whether – global warming might influence a specific extreme weather event such as the 2003 European heatwave. "That such outliers are mere freak events, so called black swans, is a possibility," they write. "However, the recent clustering of outliers makes this seem highly unlikely." Their article, "A decade of weather extremes", published in this Sunday's edition of Nature Climate Change, details a laundry list of extreme weather events that have occured since the beginning of this century, including the July 2011 record-breaking heatwave in the southern plains states of the US, the 2010 Pakistani floods, the Oman-flattening tropical cyclone of 2007, and more. As Coumou and Rahmstorf see it, although no one event can be proven to be caused by global warming, the recent cluster of extreme events taken together point toward probable cause. 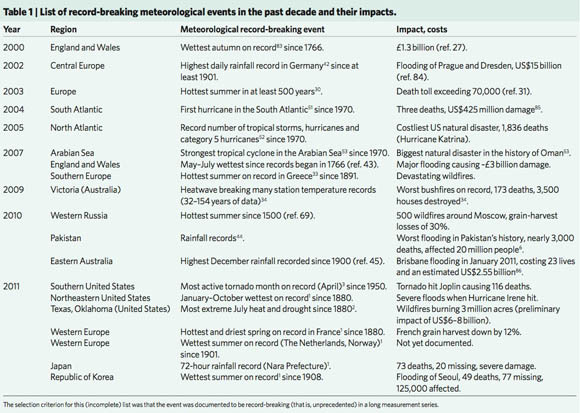 And not only do they note that extreme weather events are becoming more common, they also say that many of those events are becoming more extreme. Take, for example, the period from May to July 2007, which they say was "by far the wettest" in England and Wales since records began to be kept in 1766. That three-month period, they note, had 406mm of rain; the previous record had been 349mm, set in 1789. 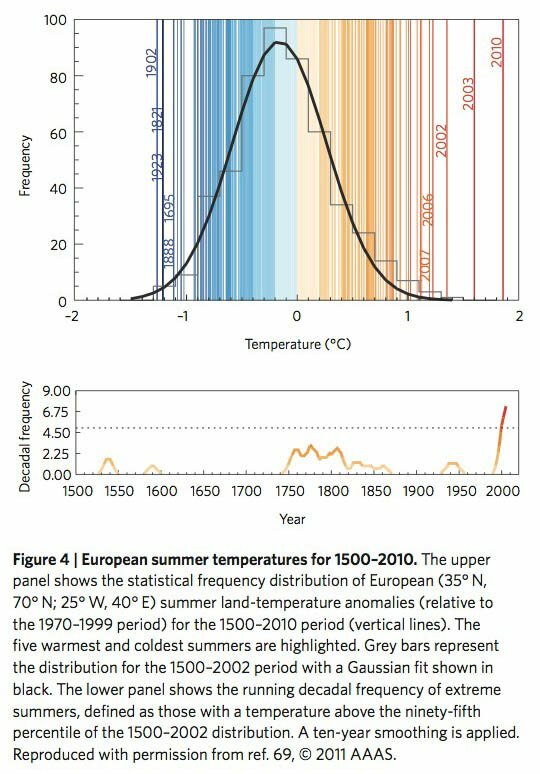 They also cite a 2007 study which showed that the length of summer heatwaves over western Europe has almost doubled, and that the frequency of hot days has almost tripled over the period from 1880 to 2005. "The number of observed local monthly heat records around the globe is now more than three times as high as expected in a stationary climate," they write – a stationary climate being one in which the global temperature is neither rising nor falling. Coumou and Rahmstorf point out that no one extreme event can be said to have been caused by the well-documented increase in what the majority of climate scientists cite as a human-influenced rise in global temperatures. After all, although climate and weather interact, the former is a global, long-term phenomenon, while the latter is local and time-bound. As one example of why care should be taken when assessing whether there is a cause-and-effect relationship between global warming and weather extremes, they cite a paper published in Febraury 2011 that examined the 2010 Russian heat wave, and which concluded that it was "mainly due to natural internal atmospheric variability" and not "human influences nor other slowly evolving ocean boundary conditions." That same study, however, also noted that "we may be on the cusp of a period in which the probability of such events increases rapidly, due primarily to the influence of projected increases in greenhouse gas concentrations." It's all about probability, not certainty, say Coumou and Rahmstorf. As tempting as it may be to assign specific weather events to climate disruption, the best that the current state of climate science can do is to assign probabilities. That said, as temperatures rise, the probabilities begin to lean towards clusters of extreme weather events such as the world is now experiencing, they suggest. "If a loaded dice rolls a six," they write, "we cannot say that this particular outcome was due to the manipulation – the question is ill-posed. What we can say is that the number of sixes rolled is greater with the loaded dice (perhaps even much greater). Likewise, the odds for certain types of weather extremes increase in a warming climate (perhaps very much so). Attribution is not a 'yes or no' issue as the media might prefer, it is an issue of probability." Speaking of probability, Coumou and Rahmstorf cite a 2004 study which concluded that "human influence has at least doubled" the chance of a European heatwave as severe as 2003's. Coumou and Rahmstorf do cite one bit of good news: a 2010 study which concluded that "it remains uncertain whether past changes in tropical cyclone activity have exceeded the variability expected from natural causes."